Check-in time is after 3:00 pm and Check-out is 11:00 am. An early check-in or late check-out can be coordinated, if available, for a fee of $50.00. $50.00 will be charged for any keys that are not returned upon check-out. Pets are allowed at pet-friendly properties only. Pets that occupy a property must be approved by the property's owner. There is a $200.00 non-refundable pet fee. A 50% deposit is required at the time the reservation is confirmed and will be applied to the total amount due. The final payment is due 30 days before your arrival. All monies paid are non-refundable at that point. The final payment will be billed to your credit card on file unless other payment arrangements have been made. We Accept VISA, MASTERCARD, AMERICAN EXPRESS, personal and certified checks, as well as money orders. If you cancel your occupancy more that 60 days before the lease term begins, your rent deposit will be refunded, less a handling fee in that amount of 10% of the gross lease amount. If you cancel within 45 days of your arrival date, you will receive no refund unless Fridays Off in Santa Fe is able to re-book that property for the same time period at the same rate. In that instance, you will be refunded 80%. All guests are expected to maintain the property in a reasonable condition during their stay. If the property is left in such a condition that requires more cleaning than usual, an additional fee will be charged to your credit card. 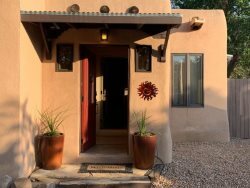 Should your occupancy be 30 days or longer, you will be required to have the house cleaned at least once every two weeks at your expense by a Friday's Off in Santa Fe housekeeper. Please ask us for details.